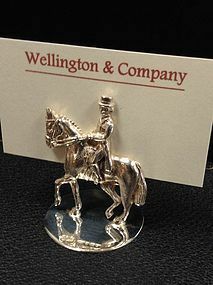 Wonderful set of modern sterling silver dressage horse and rider place card holders. Boxed set of 6. English sterling silver made hallmarked Birmingham circa 1999. Each measures 1.75" tall. Comes with original black velvet lined box.